Sunday is Superbowl 48! Lots of people are having Superbowl parties. If you are having one, I've got some great tips and fantastic recipes to help you put on a championship level soiree. Super Bowl decorations: Buy or make a banner and streamers to hang, scatter real or inflatable footballs around the party room, and dangle football-shaped balloons from the ceiling. For one Superbowl bash, we purchased green (turf-colored) blankets and made a "football field" out of the floor using masking tape. Coolers, buckets, or small tubs for drinks: If you have the space, get a few small containers and fill with ice to keep beer and other drinks cool. Place them in strategic spots so guests won’t be constantly getting up and going to the kitchen for a refill. Keep plenty of ice on hand, more than you think you’ll need. You’ll not only want to keep your drink coolers full, but non-beer-drinking guests may want to add ice to their beverages, too. Drinks: Stock up on an assortment of bottles and cans to keep everyone happy. Mini kegs are another great option—you can buy a variety of brands and they’ll contribute to the party atmosphere without reminding you too much of a frat house. Or make drinks representative of the teams playing - something with Orange Crush for Denver maybe? Or a Seattle Seabreeze? Soda or other non-alcoholic drinks: Don’t forget about the non-drinkers in your group, or those who just want to take a break in between brews. Food: Serve a mix of items to satisfy everyone, and go for both finger foods that are easy to pick up and eat— think sandwiches, chips and dips, wings, and pizza — and heartier fare like chili and barbecue to balance out all that beer. Check out the recipes below for some ideas! Make sure you have plenty of food; guests will want to replenish often during the game. Set up a buffet table off to the side where people can load up on main-course items, then have several smaller tables in the TV room with snacks that people can nosh on during the game. Plates, bowls, cups, and cutlery: If you’re going the disposable route, choose sturdy items that can hold up to heavy fare like loaded nachos, pizza, and chili. Now is definitely not the time to break out your best china—it’s inevitable that things will get knocked over during the excitement of the game. Serving platters, trays, and bowls: Pick up inexpensive football-themed items to add to the fun. Just make sure you have enough serving pieces for all the snacks you’ll be setting out. Napkins: You’ll need lots of these for wiping messy fingers and greasy spills throughout the night. Seating: After food and beer, this is the most essential element of your party. Make sure you have enough seats in front of the TV for everyone who’s attending. Ask friends to bring over folding chairs if you don’t have enough, and don’t forget to dig up those lawn and camping chairs you've stored for the winter. Put out throw rugs or blankets and scatter some large pillows so that even those seated on the floor can get comfortable. Chilly Misnomer - we may call this chili, but it packs a punch... and a hot punch at that! Herb and Garlic Monkey Bread - who doesn't love fresh-baked bread? This is wonderfully flavorful, with herbs and garlic and butter. Chicago-style Deep Dish Pizza - this is a healthier version of a Chicago deep dish pizza, but every bit as delicious. Italian Sausage Pizza - this traditional pizza comes together in a flash, and you can even throw this one on the grill if you can brave the cold! Homemade Drumsticks - can't forget about dessert. These are perfectly sized for a party too. Soft Pretzels - serve these with mustard and with cheese sauce. Perhaps even jalapeno white sauce! All American Pub Pie - dessert with beer. Need I say more? 30 Minute Chili Con Carne - spicy and meaty, this is a fantastic chili that doesn't take all day to make. Jalapeno White Sauce - this sauce is based on one we had at a local Mexican restaurant, and I could eat this every single day. Seriously. Turkey and Sage Sausage - love this sausage. Tons of flavor, and tastes great with mustard. Chicken Enchilada Pot Pies... Muffin Style - individual chicken enchiladas, in an easy to eat package! 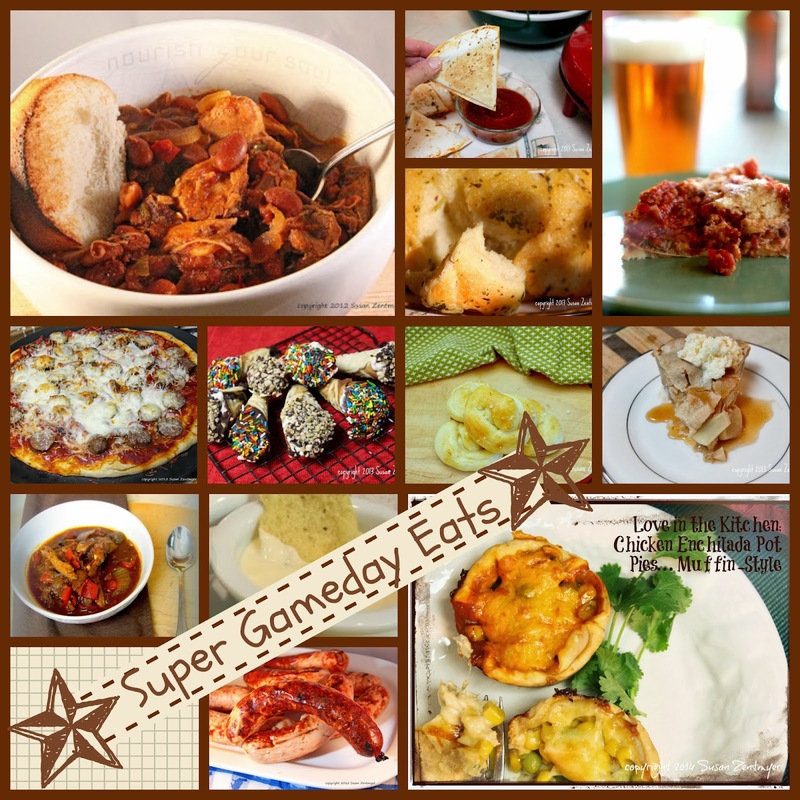 Hope this has given you some great ideas for your game-day festivities. I know we'll be enjoying the game and our guests on Sunday... may the best team win! And for those who aren't interested in the game, may the ads be top-notch! Thanks for linking this to our Super Bowl party. I bet your parties are Super. Looks like will be a tasty to take pleasure in the weekend with family. Personal Chefs conduct an in wisdom assessment of each clients’ food liking not only from a place of what and how they like to eat.